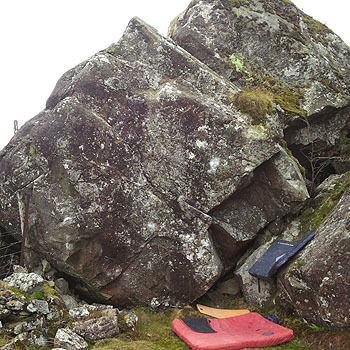 North Wales Bouldering News ::: News Details :: Rib Crackin’ Good 7A+! Owen Hayward has marked his recovery from a mountain biking injury (be careful out there folks – it’s a deadly game! [note to self from site editor]) with another superb problem on the Hidden Gold block in the Beddgelert Forest. Rib Crackin’ Good 7A+! follows the Hidden Gold sds to the diagonal jug then takes on the slanting arete above. Difficult moves gain the right side of the high slopey shelf. Follow this tenuously left to good holds then finish straight up. Check out the revamped topo in the download section.